From humpbacks off the New England coast to orcas in the waters of the Pacific Northwest, late summer is a great time to appreciate cetaceans outside of captivity. But there's a catch - if done poorly, whale-watching poses a risk to all mammals involved. When we're thinking about killer whales and other marine mammals, they're going to be using echo-location to navigate throughout their underwater environment. It can be really dark down there, so vision isn't always the best sense to use ... As noise increases, it becomes increasingly difficult both to echo-locate and to communicate using sound. So boat softly, and carry on at a wide berth around whales. (A safe distance also protects you from a surfacing whale.) As a general rule, boats should stay at least 110 yards away from orcas - that's just about the length of a football field - and travel no faster than 7 knots at about 440 yards. In the ‘90s, the group of ecotourism businesses that comprise The Pacific Whale Watch Association adopted stringent guidelines to ensure the whales they watched stay safe. Its boats begin to slow half a mile away, and won't pass in front of whales. If you're looking for orcas, consulting these guidelines is a great place to start. But if you don't live anywhere near wild killer whales, don't fret: the internet has you plenty covered. Regulations have changed quite a bit in the past decade as science catches up and gives us a better direction on how to view these endangered animals ... When I first worked on the water starting in 2006, the distance was 100 yards in US waters. A couple years ago due to best available science, the distance was increased to 200 yards. And yes, you don't go above 7 knots within 400 yards of the animals. These regulations apply not just to commercial whale watchers, but private boaters and kayakers as well. Unfortunately, not everyone is aware of these regulations. "I feel there is a huge missing gap in private boater education at large in the San Juan Island area," Walter says, as private boaters are involved in 60 percent of incidents with killer whales. 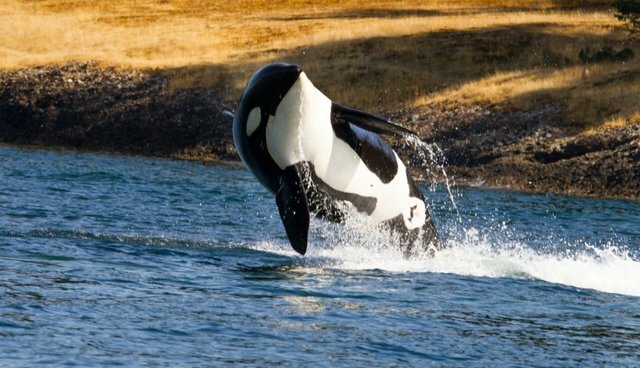 Walter believes improvements to Washington's boating courses, such as an online class to learn more about resident killer whales, could lessen this impact.